Bill Riley Keeton, Sr., age 80, of El Dorado Springs, MO, passed away Thursday, June 20, 2013, following complications from a vehicle accident. He was born February 26, 1933, to John and Grace O. (Turley) Keeton on his grandfather’s homestead near Roscoe, MO. Bill married Leota M. Ellerman on January 28, 1952, in Osceola, MO. To this union seven children were born: Janet, Johnnie, Bill Jr., Sandra, Randall, Jeffrey, and Travis. Over the years Bill worked at the shoe factory, Gleaner Harvester, for the railroad, and then retired from the Teamsters Union in 1991. He was a member of the Eagles and the Masonic Lodge. 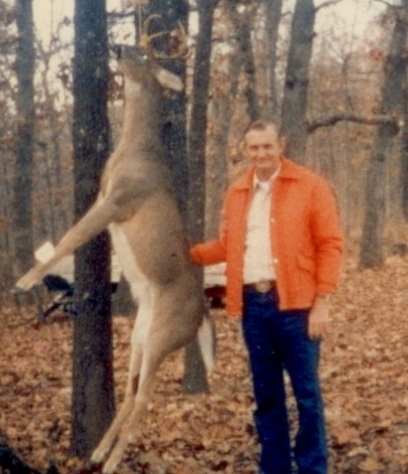 He loved to hunt, fish, and spend time with his grandchildren. Preceding Bill in death were: his parents; three sisters; one brother; daughter Sandra; son Jeffrey; one great grandson; and one son-in-law. Survivors include: his wife Leota; five children: Johnnie Ray, Sandra Dee, Randall Wayne, Bill Jr. (Mary), and Travis (Carrie); thirteen grandchildren; seventeen great grandchildren; one great great grandchild; six step grandchildren; seven step great grandchildren; two brothers: Jack Keeton (Jean) and Glen Keeton (Billie); two sisters: Dorothy Witt and Ruby Shirk; two sisters-in-law: Violet Tanner and Rose Yockey; many nieces and nephews, cousins and friends. As per Bill’s wishes, his body was donated to the Willed Body Program. A memorial service will be held at a later date. Arrangements were under the direction of Bland-Hackleman Funeral Home.